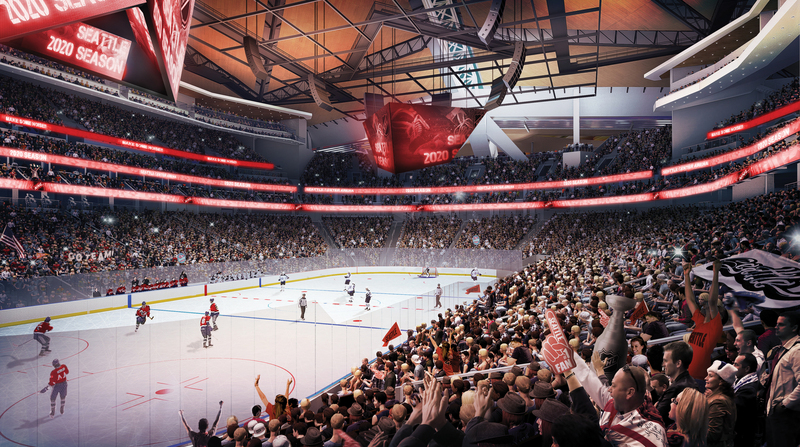 Now that the NHL has accepted their application fee, it appears that we really could see an NHL team in Seattle in a couple years. Their home will be in the old Key Arena, former home of the Seattle Supersonics. However, don't let the term "old" fool you; this arena will be brand new from the inside out. Only the outer structure will be left untouched. Perhaps the biggest revelation for us from the most recent renderings is that they appear to be considering a dual scoreboard/video screen system. This would be the first of its kind in any North American professional sports arena. Obviously it is early, but this is the second wave of renderings now to show the same concept. What do you think of the idea of two hanging scoreboards as opposed to one center hung scoreboard? Leave your thoughts in a comment below.